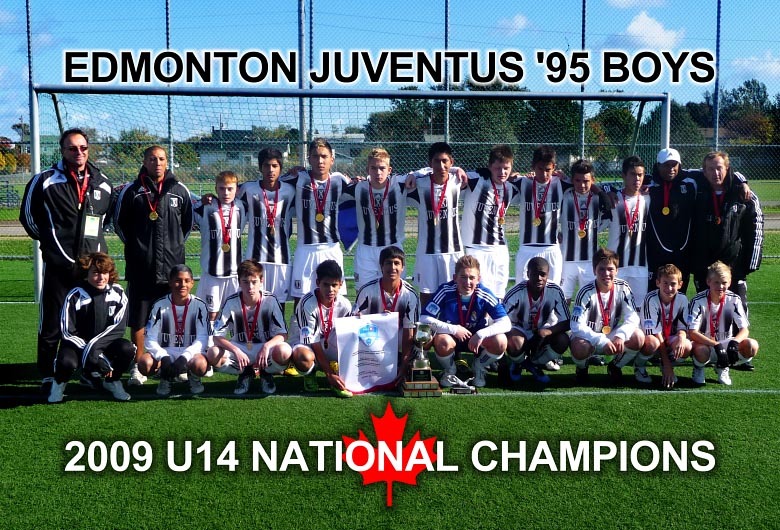 In the last week of August the Juventus 95 U14 Tier 1 Boys team travelled to Lethbridge for the Alberta Provincial Championships. After a league season which saw them go unbeaten in 14 games they had high expectations but knew that all their games would be against very competitive opponents. They were successful in all 3 games scoring 9 goals while not conceding one. With their Provincials victory, they earned the right to represent Alberta at the Canadian Club Nationals Championship in Sydney, NS Oct 7th to 12th. Congratulations to all the players, coaches and parents for all their efforts and support. 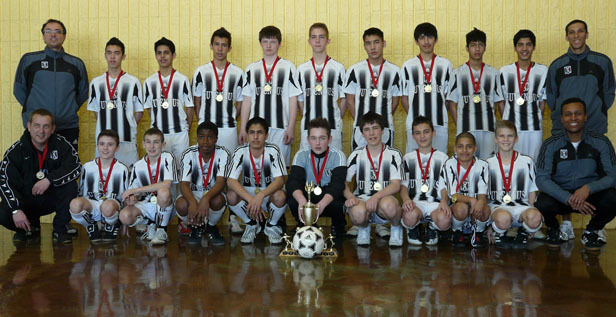 On the weekend of March 20th the Juventus 95 U14 Boys team travelled to Calgary to defend their Provincial Champions title. They did so in convincing fashion giving up only 3 goals while scoring 34 in 4 games against the top teams in the province. This indoor season they played up a division against boys a year and sometimes two years older than themselves but won the league comfortably. They also won Gold in all 3 tournaments they entered. Congratulations to all the players, coaches and parents for all their efforts and support. We look forward to a great Outdoor season ahead. Sebastian Cabrera, Anoop Sahota, Mathieu Coones, Haris Kevac. 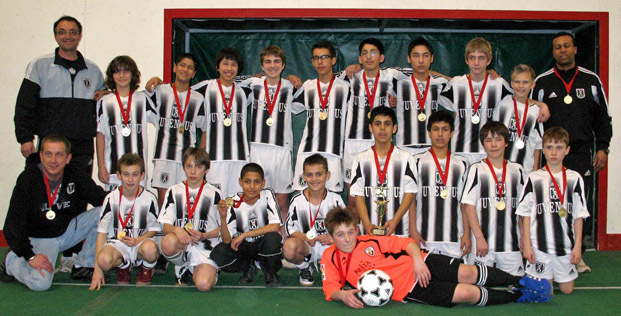 The Juventus 95 boys traveled to <?xml:namespace prefix = st1 ns = "urn:schemas-microsoft-com:office:smarttags" />Calgary in the middle of March to attend the Indoor Provincials. team come away with 2 consecutive Silver medals but this time around the boys were determined to bring back the Gold. In the first round they were victorious over the Calgary 3 seed- 6-2 as well as a 6-0 victory against the Grande Prairie Wolves. The semi final match was against a much bigger physical Calgary 2 team but the boys fought hard for a comfortable 7-2 victory.